TEL AVIV, Israel (AP) — The Israeli military confirmed Wednesday it carried out the 2007 airstrike in Syria that destroyed what was believed to be a nuclear reactor, lifting the veil of secrecy over one of its most daring and mysterious operations in recent memory. Israel’s involvement has been one of its most closely held secrets, and it was not immediately clear why Israel decided to go public now. The military would not comment on its reasoning, but the move could be related to the upcoming memoir of former Prime Minister Ehud Olmert, who ordered the strike and has hinted about it for years, or it could be meant as a warning to archenemy Iran, which is active in Syria. Israel and Syria have always been bitter enemies. Throughout Syria’s seven-year civil war, Israel has carried out well over 100 airstrikes, most believed to have been aimed at suspected weapons shipments destined for the Iranian-backed Hezbollah militant group. Both Iran and Hezbollah are allied with Syrian President Bashar Assad. The strike was reminiscent of an Israeli attack in 1981 against a reactor being built in Iraq. The strike was later credited with preventing Saddam Hussein from acquiring weapons of mass destruction that could have been used in the Gulf War a decade later. The military said the F-15s took off from two bases in southern Israel at 10:30 p.m. on Sept. 5 and returned four hours later. Wednesday’s announcement also indicated the Syrian reactor was much closer to completion than previously reported. 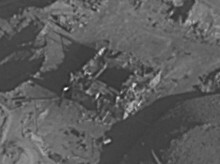 From Israel’s perspective, the strike was an astounding success since it not only destroyed the site, but prevented further escalation and strengthened its deterrence in the region. Uzi Rabi, an expert on Iran at Tel Aviv University, said Israel’s surprising confirmation might be meant as a “warning sign” to Iran as it expands its military footprint in Syria. Israel has warned against the establishment of a permanent Iranian military presence in Syria, particularly in areas close to Israel. The military said it began obtaining information regarding foreign experts helping Syria develop the Deir el-Zour site in late 2004. Later it discovered that North Korea was helping Syria build a reactor to manufacture plutonium. In his memoir, “Decision Points,” former President George W. Bush said Israel first asked the U.S. to bomb the site and then carried out an attack itself when Washington declined. The strike came about a year after Israel’s inconclusive war against Hezbollah, in which the Lebanese guerrillas battled Israel’s army to a stalemate. The poor performance raised questions about Israel’s deterrent capabilities. “Prime Minister Olmert’s execution of the strike made up for the confidence I had lost in the Israelis during the Lebanon war,” Bush wrote, adding that the Israeli leader rejected a suggestion to go public with the operation. “Olmert told me he wanted total secrecy. He wanted to avoid anything that might back Syria into a corner and force Assad to retaliate. This was his operation, and I felt an obligation to respect his wishes,” Bush wrote. Olmert, who was prime minister from 2006 until 2009 and was recently released from prison after serving time for corruption, is expected to delve more deeply into the issue in his upcoming book. The disclosure looks to help rehabilitate at least part of Olmert’s tarnished image while damaging the legacy of his longtime rival, then-Defense Minister Ehud Barak, who was reportedly hesitant to strike in Syria.